What and where to test? So where do you start? First you need a goal. What do you want users on your site to do? Complete a form, buy something, sign up for a newsletter? Without a goal, it's difficult to optimize, so you should be sure to define one if you haven't already. Once you have a goal, you can use Google Analytics to identify those pages that are having the biggest negative impact on the total number of people "converting," or achieving that goal. These are the pages to test. This report gives you instant insight into how well (or poorly) your landing pages are performing. You want to find pages that have both high "entrances" and a high "bounce rate." 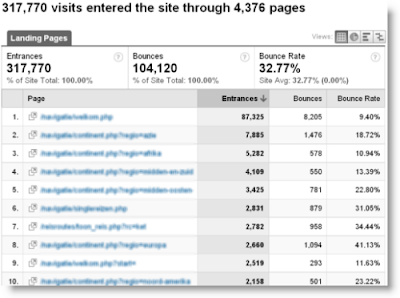 These pages are costing you a lot of visitors. 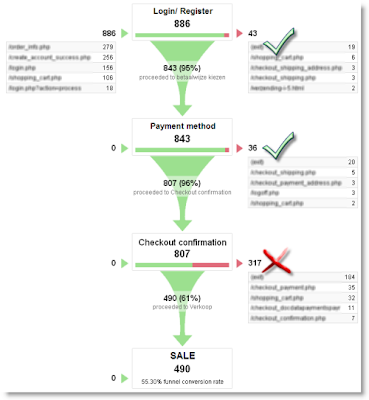 The funnel visualization in Google Analytics shows you where people leave during your buying process. For example, the below report shows that 40% of the 200 potential buyers left during "Step X" in the checkout process. Average order value is $100. This means the merchant is losing up to $8,000 in revenue every month due to "Step X." With this report, you should look for pages that are designed to sell, but have high exit rates. 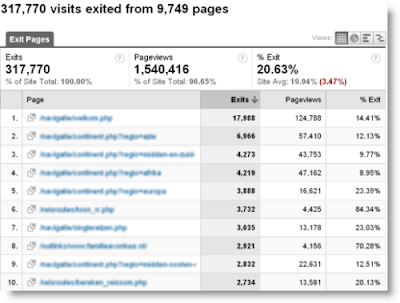 Using the top content report, I see that my product pages have a 35% exit rate. These pages are supposed to persuade potential customers to add products to the shopping cart, so they would be good candidates for optimization. Having looked at these reports, there's a fair chance you've found high-impact pages that perform below average. If not, you can take a look at the "top content" report and pick a few pages that see a lot of traffic, but are poorly designed or out-of-date. Google has a free tool to test you pages called Google Website Optimizer. Find out more here . Make sure you get to see your variances in Google Analytics. In the case of an A/B test this is relatively easy. Tag your variances with the GA code snippet and perhaps give them a unique name. For a multivariate test this requires a little bit of technical knowledge; you have add a little bit of code to your test page. You’ll find the instructions here. Create Advanced Segments and extra goals in your testing profile relevant to the test. This lets you evaluate the test outcome on different visitor segments. Have another resource? Add a comment!